San Jose, California – Ocober 30, 2017. Key Housing, the “go to” service for extended-stay and corporate housing in San Jose and all of Silicon Valley, is proud to announce its featured apartment for November, 2017, is the Bella Villagio property. Located in the hub of Silicon Valley, the San Jose corporate apartment units offer cozy accommodations for business VIP’s and long-term vacationers alike. Fully furnished units including full kitchens and baths may help a corporate VIP feel more comfortable away from home. To learn more about Bella Villagio, Key Housings featured property for fall 2017, please visit the website. 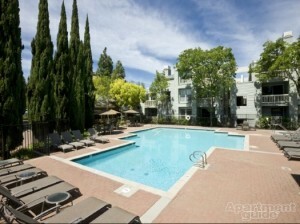 The San Jose corporate apartments include fully-furnished units, cooking kitchens and cozy courtyards. Contracted employees or VIP’s seeking short-term stay apartments for business can find a home-like environment to reside in. Persons seeking to learn more about housing options in San Jose can also visit the company’s lively blog. Here is background on this release. The chill of fall can entice Silicon Valley residents to cozy up in a warm home after work. Indoor activities such as watching football, playing board games or cooking for the holidays can become the norm for locals around October and November. If a contracted employee from out of town requires lodging in San Jose, a pumpkin spiced latte in a hotel room may not be the in spirit of the season. Family may have been left back home in another state. Cooking processed meals in a microwave or sitting by the electric heater alone could be depressing. Long-term stay employees may find it comforting to live in a “home like” environment while on business. The Bella Villagio might be the best San Jose corporate apartment for visitors. For these reasons, Key Housing has announced Bella Villagio as the featured property for November for Northern California. The San Jose corporate apartment unit can be found in the heart of the city. Warm old-world charm mixed with modern accommodations may help a travelling VIP feel more at home. Easy access to grocery shopping can mean cooking healthy, hot meals in a fully functioning kitchen. Opportunities to socialize by a cozy fireplace or sip coffee in the courtyard may offer guests a sense of community. Private parking, warm spas and a fitness center can also be found at Bella Villagio. Working during the holidays may seem difficult for persons leaving family behind. Booking the right San Jose corporate apartment during the fall season might not leave contracted employees out in the cold. Based in Folsom, California, Key Housing Connections Inc. specializes in corporate housing and corporate rentals in large cities like San Francisco, Los Angeles or San Jose as well as smaller cities like San Mateo, Pasadena and Walnut Creek. Key Housing is a leader in affordable, friendly, short-term and corporate housing rentals in places like Redwood City, Santa Monica, Newport Beach and just about every city in California. Whether it’s a San Jose corporate apartment or a San Francisco short-term stay rental, just search, click or call today! This entry was posted in Corporate Housing, Press Releases and tagged San Jose, San Jose Corporate Rentals, San Jose Serviced Apartments on October 30, 2017 by Lee McDonald.